2015 National Hopes Week & Challenge a success!!! 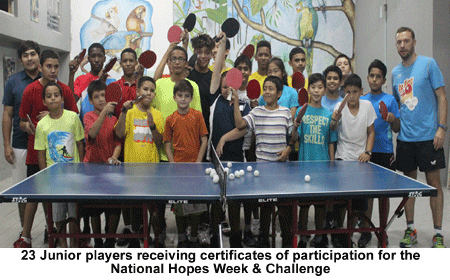 BELIZE CITY, Fri. Dec 4, 2015–The National Hopes Week & Challenge concluded this past Monday, December 1, with over 23 Junior players receiving certificates of participation in the closing ceremonies of the program at the Belize Table Tennis Association (BTTA) training facility located at Body 2000 gym on Coney Drive, Belize City. 23 Junior players had the opportunity to work with International Table Tennis Federation (ITTF) High Performance Coach Aleksey Yefremov of Belarus for one week leading up to the National Hopes Challenge Tournament staged at the Belize Elementary Auditorium on Saturday, November 26. The National Hopes Challenge is a part of a wider ITTF initiative which seeks to identify the world’s top Under 12 cadet players, as well as to work with local coaches to improve their skill level. Each participating country is responsible to set up a National Hopes Week to identify their best Under 12 cadet players. These players then go on to a Continental Hopes Challenge Week, and the winners at that event move on to the World Hopes Challenge Week. The training camp began on November 21 at the Body 2000 training facility with two sessions, each catering for a different age group. The Under 12 cadets trained each day from 4-6 p.m., while the Under 15 cadets trained from 6-8 p.m. Expert Aleksey Yefremov prepared different activities each day, tailored to improving the players’ technical abilities and overall tactical game. Additionally, in the mornings, in a separate session, Aleksey Yefremov worked along with local coaches to improve their knowledge of the sport and their technical ability. At the end of the event, medals were presented to all winners of the main draw by ITTF High Performance Coach Aleksey Yefremov, and he explained what road lay ahead for the top two cadets who made it out of this week’s challenge. Taye Parkinson and Jude Castellanos will go on to represent Belize in the Continental Hopes, in hopes of making it to the World Hopes Week. The association thanked Aleksey Yefremov for his hard work and the ITTF for their Initiative at developing the sport of table tennis in countries like Belize and all over the world.